It's been 1 year and 9 days since my first Football Season Preview (here's the article in case you need to relive the past), so why not do it again. Without further delay, the 2nd Annual Red Rider Sports Blog Football Season Preview. 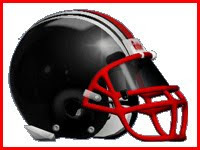 I mentioned this at the end of the 2008 season, but the 2009 season is (by my records) the 100th season of Orrville Red Rider football. We've amassed 569 wins in 953 games over the first 99 years and had plenty of memorable games, players, coaches and seasons over the first century of Orrville football. Let's hope that 2009 is a special capstone on the first 100 years. I'd love to see a 100 year anniversary logo on the helmets this year. Maybe not something gaudy like this.....but maybe a small '100' logo on the back of the helmet. So let's start with the low hanging fruit. We will find out very early in the '09 season whether this team is a special team capable of a deep playoff run, or another team that can't seem to beat the "bigs" on the schedule. With three of our first 4 games coming against 2008 playoff qualifiers (Northwest, Triway & Lexington)...the Riders can see their season get off to another tough start, or they can serve notice to the county, conference, region and state that they are a team to respect and a team to fear. The challenges don't end after week 4 though...trips to both Mansfield schools (never a treat), a trip to West Holmes (a team we haven't beat since 2006), an improved Ashland team, an always interesting trip to Bellville (Clear Fork) and a run at 4 straight shutouts and 5 straight wins over arch rival Wooster await the Riders. Not to focus on one game, but the Lexington game in week 4 has the potential to be one of the biggest games in recent memory at Red Rider Stadium. Lex will come in potnetially ranked in the top 3 of all Division II and will feature Michigan commit and "All-World" quarterback Courtney Avery. This game (win or lose) will serve as a huge test and barometer for just how far the Riders have come and may go in '09. Each and every week will be a different set of challeges for this years team. Our roster is deep and talented. Seventeen seniors dominate the roster and virtually all skill positions on both sides of the ball have a large senior presence. In my opinion, it's the most talent we've had since the 2006 regional finalist team. Our defense might just be the best unit since the 1998 state title team, and possibly as far back as the 1995 state semi-finalist squad. As mentioned on this site months ago, the Riders bid farewell to the ultra tough Region 13 and now reside in Region 14. Our 7 wins were good enough for 10th place in region 13, and would have put us in 5th place in region 14 last year. Plain and simple, there are less "elites" in region 14. No Steubenville's, Mooney's, St V's or CCC's. Since 2000, no team has missed the playoffs in Region 14 with more than 18.000 points. And last year, the #8 seed (Sparta Highland) had a paltry 11.950 points and a 6-4 record (with 5 of the 6 wins coming against Division 5 teams and all 6 wins coming against teams with a combined record of 22-38). Still plenty of solid teams, but teams that I think we matchup well with. I will say that our strength of schedule is better than most every team in the region except for maybe Elyria Catholic. While most teams are beating D5 and D6 teams, we have SIX division 2 teams on our schedule. A win over a D2 school (5.5 first level points) is like 1.25 wins over a D6 school (3.5 first level points). It works in our favor, as long as we're winning games. It's just a more even region (not easier), that is void of any dominant team. To illustrate my point, Clear Fork finished 5-5 last year and missed a playoff spot by less than a point. I don't think the region will be that weak this year, but it certainly will not take a 10-0 or even an 8-2 season (IMO) to make the post season. I'd rather not take any chances though. The worst part about this region is the geography of it. Look at the area the region covers (Click on each helmet for driving directions, zoom in for a look at their stadium). We could really put some miles on our cars if this team goes deep in the playoffs. I'm sure very few of us would have a problem with that. I don't think we've had this much balance on both sides of the ball in quite a while, and certainly think it's our most talented team since the 2006 regional finalist team led by Kyle Simmons, Josh Bowman, Isaiah Tyler and Brad Thomas. Joe Besancon will return for his 2nd year at the helm of the Rider offense. He had a very productive junior season and is a threat to pass and run very effectively. What may be different this year are the options behind him at running back. Going into the season, there appears to be a multitude of backs that seem to be eager to bring Orrville football back to the days of 3 yards and a cloud of dust. Seniors Thirajn Pittman and Dillon Corbett, junior Tre Simpson and sophomore Mason Monheim give the Riders a potential run game not seen in over a decade. Besancon will also have a many options to throw to as well...led by seniors Sam Miller, Chase Hoobler, Corbett and Jordan Thomas...juniors Max Pirman (when he returns from a collarbone injury) & Cody Rice...and sophomores Drew Brenner & Dylan Lemmon. An experienced line that saw a lot of time last season will only add to our effectiveness as an offensive unit. The line will be anchored by seniors Vincent & Victor Monheim and junior Sam Reusser. Other that stand to make contributions include JT Mosley, Derek Vance, Daniel Groves, Dennis Raber & Derek Graber. As good as our offense will be, our defense may be even better. Many of the offensive standouts will also contribute on defense. The unit led by Coach Haley will be anchored in the middle by Chase Hoobler and Mason Monheim at linebacker, Mosley & Raber on the defensive line, and a host of capable DB's led by safety Sam Miller. Simply put, there's talent on both sides of the ball and at every position. 1. Win the big games. We've seen how losses to these teams have had a negative affect on our playoff standings. Winning 3 of the first 4 games (or all 4) will put us on the right track. 2. Steady QB play. Joey does not need to make plays with his feet this season. He's got weapons behind him and he'll have weapons to throw to. He needs to be smart and manage a good game. He'll have plenty of opportunities for himself if he does that. 3. The "Black Swarm" Defense. This unit has a chance to be very special. They have the strength, speed and experience to shut down opponents. 4. Special Teams. New kicker this season with the graduation of Aaric Milligan. A dependable kicker is invaluable. We've been real spoiled in Orrville with kickers and quarterbacks. 5. Shutout #4? No one associated with the team will say it (and I'm of the thought that there are bigger goals for the season) but a 4th straight shutout of Wooster would be an amazing feat. It would be athe 5th straight win over big blue, and even the decade series at 5-5. You have to go back to the 60's to find the last decade where Wooster beat Orrville more times than not. This would set the stage for the 2010 matchup which would be the 100th game in the rivalry. 6. Getting to the next level. Plain and simple, it's put up or shut up for this senior class. Plenty of hype, zero playoff appearances. I'm confident that they have what it takes this season. I think at worst, the 2009 Riders go 8-2....and with the right breaks, there's an outside shot at going 10-0. I think our talent and the senior leadership simply will not allow this team to underachieve. I'll make an honest prediction of 9 wins and 1 loss. For a little self promotion, your fearless blogger will be right there with the Riders every step of the way. Game previews, region standings and any other pertinent news will be plentiful. My Twitter page will be used to highlight the press all the Red Rider teams receive throughout the season and I'll post in game updates when possible for some of my out-of-town readers. We'll also follow Red Riders playing college ball as we did last season. Should be fun. Good luck in '09 Riders. Leave it all on the field. Play for your family, play for your coaches, play for your teammates, play for Riders of the past and future, play for your classmates, play for this community. We will all be there to support you every Friday night. Hopefully we can all gather in the shadows of the Pro Football Hall of Fame in Canton, at Fawcett Stadium at 11am on Saturday December 5th to cheer the Riders on in the Division IV state title game. Looking forward to the season and to your in depth coverage each week.